Majlis A\'Shura hosted at his 21st sitting of its third annual session under the chair of Khalid bin Hilal Al Ma\'awali, Chairman of the Majlis A\'Shura today Yahya bin Said Al Jabri, Chairman of the Special Economic Zone Authority in Duqm (SEZAD) who made a presentation on the Special Economic Zone in Duqm. 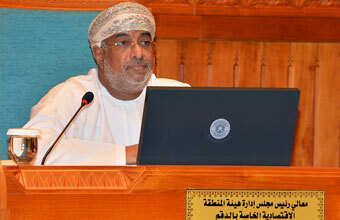 At the beginning of the sitting, the Chairman of the Majlis A\'Shura pointed out that the presentation includes the major strategic features of the Special Economic Zone in Duqm, its main objectives, the major economic and investment projects, the underway programs, especially those related to infrastructure projects, the dry dock and the industrial zone. He hoped that the presentation will cover the one stop shop system and custom management system and ways of land usufruct, the competitiveness of the zone and its ability to attract foreign investments. At this visual presentation, Yahya bin Said Al Jabri, Chairman of the Special Economic Zone Authority in Duqm (SEZAD) highlighted the economic advantages of SEZAD and cast light on the existing projects such as the Drydock and ship repair yard. He pointed out that the number of projects that have been completed stood at 29 at a cost of more than RO1.7 billion including the commercial terminal, the Drydock, A\'Duqm Port, power plant, water desalination plant, electricity distribution network, water distribution network, main road, sanitary drainage plant, Crowne Plaza Hotel, City Hotel, the hospital expansion, the Drydock and employees camp. The presentation covered other projects, such as natural gas supplies, railway, the port belt, the internal roads, the expansion of the water distribution network, the expansion of the electricity network and the sanitary drainage network. The presentation also highlighted the marketing and promotion efforts including the underway negotiations with A\'Duqm Oil Refinery and Petrochemical Industries, for 1000 hectares and with A\'Duqm Port Company for 2000 hectares of industrial lands. Afterwards, there has been discussion on the data and indicators of the presentation. Muscat, June 11 2014 - The State Council hosted in its 9th regular meeting of the 3rd annual sitting of the 5th term, chaired by Dr. Yahya bin Mahfoudh al-Manthri, Chairman of the State Council today Yahya bin Said Al Jabri, Chairman of the Special Economic Zone Authority at A\'Duqm (SEZAD) who gave a video presentation on Duqm Economic Zone. The session started with a speech by the Chairman of the State Council in which he pointed that the A\'Duqm Special Economic Zone is one of the important strategic projects by which the Sultanate seeks to invest its geographical location and its long and open seas as a bridge for inter-trade between East and West. He added that the presentation by the officials of SEZAD will address a number of major themes, including the strategy and features of the region, the most important programs and projects planned and being implemented, particularly with regard to the infrastructure, economic and investment projects, along with qualified and trained human resource to take their appropriate positions in the management and operation of this vital facility. Al-Jabri said that much had been accomplished, and the region became a reality in the national economic scene of the Sultanate, but there are still some challenges that must be met by faith, which is to continue government spending program which was called \'project to develop the Wilayat of A\'Duqm \' and provide it with the necessary additional financial allocations in the ninth five-year plan of the State. The Chairman of SEZAD answered all questions and inquiries made by members of the State Council about A\'Duqm Economic Zone.